Check out these sample tracks. 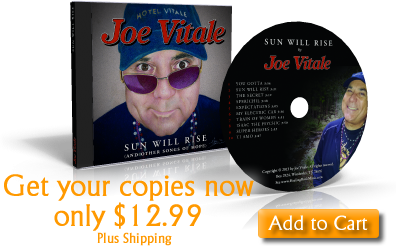 Let the FUN Begin: From Rockabilly to Reggae and Everything in Between – I think you’ll agree, third time’s the charm, this may be his BEST effort yet – Howlin' Joe Vitale's Latest Collection of Healing Songs HITS ALL THE RIGHT NOTES! And you absolutely refuse to buy-in to the shallow superficiality of today's "pop-stars," and their mindless, meaningless messages of fluff! You'd simply rather not support the money-grubbing music-industrial-complex and their negative unflattering stereotypes of what success is and should be all about! There are very few REAL artists anymore. If they're not pandering to the caricature of what some behind-closed-doors focus group says the typical "fan" wants … then they're placating an out-of-touch over-the-hill studio exec - that long ago forgot what it was like to produce honest music with heart. It's all about pie-charts, bloated corporate profits, and the 18 – 24 demographic these days. And somewhere in the middle of all this chaos … the music got lost. Present day "artists" are little more than cartoon characters playing a role. Technology does most of the work. Heck, many big-name, big-ticket high-dollar concerts aren't much more than a taped recording – why bother! I say, it's time we take music back! It's high-time we demanded our musicians sing honestly, fairly and once more with feeling (HAHA - I couldn't help myself on that last part). Nothing exposes your heart and all its vulnerabilities to a jaded public like producing music. They love it … they hate it … and they ALL have an opinion - and aren't afraid to voice it! Seriously, I want unfiltered, unprocessed, authentic music played and sung by a real artist unafraid to reveal their passion. 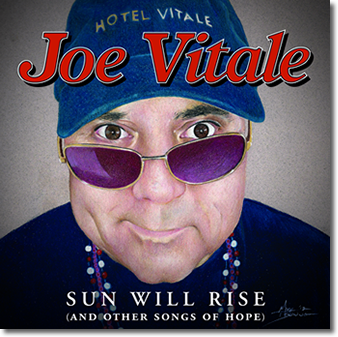 And if you'll permit me, I'd like to introduce you to such an artist – a man who wouldn't touch an auto-tune with a 10-foot pole … a raw emotional singer, amazing songwriter … and the world's first and ONLY self-help musician: Dr. Joe Vitale! 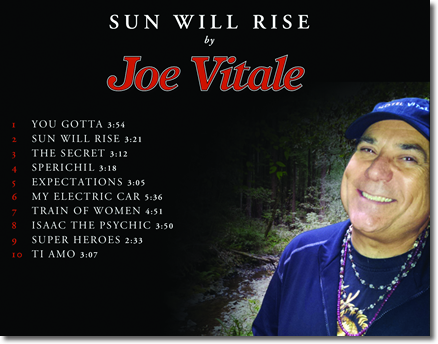 Joe Vitale burst onto the music scene delivering an eclectic range of experiences – everything from peaceful healing meditation music to raucous blues and rock-n-roll. 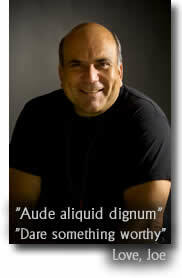 He’s an accomplished musician with five titles to his name, including two previous singer/songwriter albums. Joe's latest offering, Sun Will Rise is an emotional journey through the ranges and depths of one's soul. You'll have a blast with FUN songs like You Gotta and Train of Women - be haunted by the eerily familiar musings of The Secret, tortured by the angst-filled vulnerability of a love song with Ti Amo, and brought to your feet by rousing toe-tapping pure musical excitement making up the rockabilly treat, Sperichil! With Joe’s special brand of fun healing music with a message, you get a dimension to your listening experience NOT FOUND on the Cd’s of contemporary artists. "You Gotta!" – Self-help rock-n-roll that's fun, upbeat and carries the message, "you gotta" take action. Being a big proponent of action, Joe feels like this song and its message is the right lead for his new album. "Sun Will Rise" – Stream of consciousness creation at its finest, Joe said this one came to him "out of the blue" as he held his guitar. Like a gift bestowed upon and through him, he shares this creation with you now. His Guitar player Daniel was speechless when he heard it – and said it had the potential to be a radio hit. This song reminds you that no matter your circumstances, the sun WILL rise again, you just gotta have faith. "The Secret" – Conversely inspired by the haunting styling’s of Leonard Cohen's "Everybody Knows," with its hypnotic refrain – but dark negative message. A great song to commit suicide to, as Joe puts it - he decided to break away, going positive: "I wanted something healing." Something that'll do you good to listen to … The Secret is it. "Sperichil" – Wild, happy, rockabilly music, it's pure fun. The voice, vibe and lyrics are all about being happy – now! The title, Sperichil is an early spelling of the word "spiritual." This happy, contagious recording makes me smile with every listen, says Joe – and don't miss him howling like a wolf during this wild good time. You’ll be grinning from ear-to-ear; happy, healing music at its rawest! "Expectations" – This is magical, a hypnotic intermission of Joe playing a special double-neck guitar; the top is a regular guitar and the bottom is a baritone guitar. Backed by the professionals, Joes says the result is something he could listen to all day – you'll feel the same way! "Call this one Expectations," He said, because it suggests something is about to happen, but you don't know what. With this healing soothing interlude highlighting the moment; what will you expect? "My Electric Car" – Is this the first gas guzzlers anthem? Joe's relationship with his electric car is … complicated – it ain't all been fun. But he says he loves THIS song because of the lyrics and the blues rock music the band brought to the session. Joes says there are moments that send shivers of joy up his spine, he says it's an example of how music becomes magic. You gotta hear it. "Train of Women" – Fun, fast, funny, it’s a rock ballad about a man facing his fears and falling in love. But first, he'll have to contend with one hundred and fifty bikini-clad women who've come to see him. Afraid at first, he asks for everything from a crocodile to a bodyguard to being taken to Area 51 (yes, I said Area 51 – you know, where they faked the moon landing J). What looks like your demon is really your angel in disguise, as the old saying goes. Joe calls it a Rorschach test song – you get from it, what you get from it. It's a mirror, healing music at its best. Rock on! "Isaac the Psychic" – I'll let the man himself tell you about this one, take it away Joe: Isaac the Psychic is my attempt to create a Shel Silverstein – Johnny Cash "Boy Named Sue" kind of song. I came up with a character, and a story, and a funny chorus, and weaved it into a song. My band – the experts that they are – created a Reggae upbeat rhythm and the whole thing came together. It's funny and memorable. You'll smile listening to it. 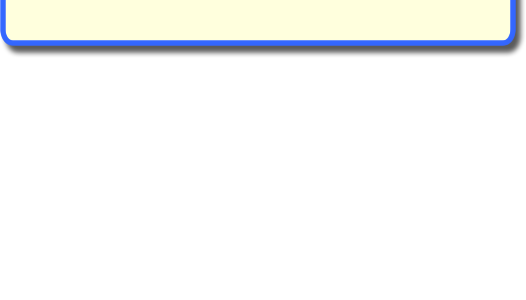 After all, I'm so psychic, I know you're reading this. "Super Heroes" – Funny how life’s a series of serendipitous events. Mathew Dixon, Joe's guitar teacher had just taught him a new chord progression, and Joe put words to that progression inspired by meeting actor/bodybuilder/Hulk Lou Ferrigno, and actor/Superman Dean Cain. Using messages from their characters Joe created a feel good, relaxing song that could be a theme to a TV show today! It's about you being the new super hero – don't wait for a hero – be one NOW. "Ti Amo" – Again, I'll let Joe speak for himself about this intensely personal creation: Ti Amo was written for my love, Nerissa. I felt the urge to write a love song and thought what better way to do it than to think of who I love and just write a song for her. I did. I believe anyone can feel the love in this one. Nerissa says she does. Love heals. That's TEN heartfelt expressions of emotion and music and magic. Richly combined, forming a personal experience that's different for every listener. You won't hear electronic syncopated synth riffs on this one! Best of all … you can get all ten of Joe's fun, uplifting, hip, healing, bluesy, rock-n-roll power tunes for the low, low price of Only 12.99 (plus shipping). Why don't you get your copy right now! So NEXT time you reach for the radio - or a Cd to put in the player what will it be? Or will you choose Joe? And be rewarded with honest music created in the studio by a band of brothers. And NOT simply cobbled together in the back room on a computer - by a techno-geek sampling tracks. When Joe and his band get together, it's an event, a party, a fun, spirited jam session that comes through on this album. It's the way music was meant to be created. Don't get left out – join in on the FUN. from the heart. The instrumentation is the richest yet, and fits each song really nicely. I especially like the saxophone work, though it is all very well done. makes the point that everyone is psychic. There are many delights here, yet my personal favorite is "Ti Amo," where you really bare your heart. You and Nerissa are a wonderful and very special couple. this with me and with the world!" "Your new album is another success in my opinion. My two year old son is going through a very intense superhero phase right now and went ape over your Super Heroes song. Your new album pretty much stays in our stereo at home all the time. You have such a wonderful, eclectic sound to all of your albums and that makes your work such a treat to listen to." "Listened to Sun Will Rise all the way home. Magnificent! world now. Loved the song Train of Women. So fabulous!" "Your best, most fun CD yet!!! You've got your groove goin'! Love songs 'Ti Amo'! And 'Sun Will Rise'"!!! DIRE PREDICTION: Crowding-out of the small-biz merchant, and independent artist by expansive soul-less conglomerates has already lead to the demise of the neighborhood record store. I predict … there’ll come a time very soon when you won’t be able to buy pure honest music like Joe’s. 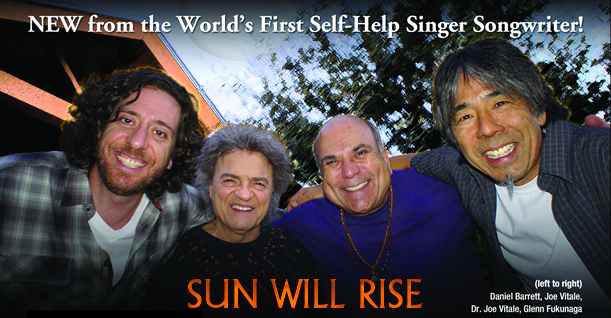 Don’t wait, support your independent artists before it’s too late – get the Sun Will Rise today! Note: "The Healing Song" is Copyright 2012 Joe Vitale and David Darling. You may not sell it or broadcast it without written permission from the copyright owners. It is offered for your personal use for entertainment purposes only.